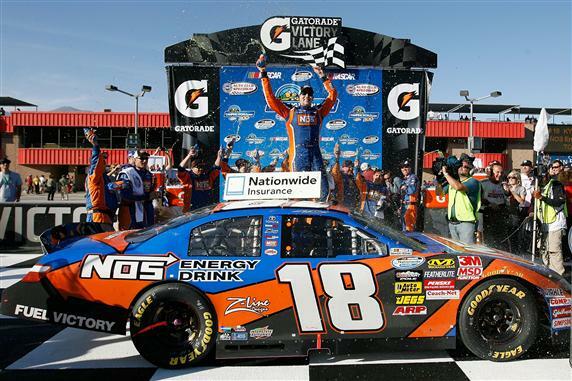 FONTANA, Calif.— Kyle Busch’s pit crew may well deserve the credit for winning Saturday’s CampingWorld.com 300 NASCAR Nationwide Series race at Auto Club Speedway. To Kevin Harvick, on the other hand, there was little doubt that his pit crew lost it. Strong on short runs but no match for Harvick on longer ones, Busch rallied from a pit-road speeding penalty to beat NASCAR Nationwide points leader Brad Keselowski to the finish line by 1.034 seconds. The victory was Busch’s 12th of the year (extending his single-season record), his fourth at the 2-mile track and the 42nd of his career—leaving him six behind series leader Mark Martin in career wins. Harvick ran third, despite leading a race-high 86 laps. Carl Edwards, second in the series standings, came home fourth and trails Keselowski by 384 points with five races left. Joey Logano finished fifth. Busch, who was penalized for speeding while entering pit road under caution on Lap 87, won for the third time this year after incurring a speeding penalty. Danica Patrick saw a promising run spoiled when contact from James Buescher turned her No. 7 Chevrolet into the wall on Lap 141 of 150 to cause the sixth and final caution. Patrick was running 17th at the time, hoping for her first lead-lap finish in her eighth NASCAR Nationwide start, but the wreck relegated her to a 30th-place result. Pit work on Lap 126 turned the race in Busch’s favor, after a 12.8-second stop got him away with the lead. Harvick’s crew had its third poor stop of the afternoon, leaving the driver of the No. 33 Chevrolet in sixth position for a restart on Lap 134. Two cautions that punctuated the final 17 laps helped prevent Harvick from challenging Busch for the lead. "The pit stops were what got us there," Busch said, "just being able to have the guys give us a good pit stop on that last time and get out front when it mattered most and kind of set sail on the restarts. "Harvick had a really, really good car on long runs. He showed that today—he probably had the best car. We could keep up with him for about eight or 10 laps, but after that, he started getting away from us." After the race, Harvick praised the team that prepared his car at his race shop and blasted his over-the-wall pit crew. "The guys have done a great job in transitioning to some new setup packages and doing the things they need to do to make them fast—and those are the guys I feel the worst for," Harvick said. "We’ve got guys that just roll up on the weekend and just flat-out aren’t doing a very good job on pit road."